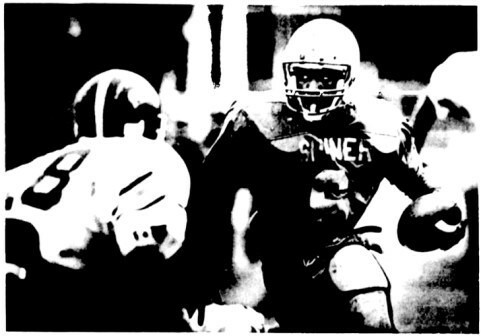 Shiner's Gilbert Price races around Allen Neuman on his way to an 82-yard touchdown run. Shiner went on to defeat Mart 18-0 for the championship. LEANDER - Reflecting the ferocity of its nickname, the Shiner Comanches captured the first football state championship in the school’s history with an 18-0 victory over the Mart Panthers Saturday afternoon at Lion Stadium. It was nothing short of a massacre. Shiner's offense rolled up 290 yards of total offense, 265 on the ground, as quarterback Gilbert Price rushed for 156 yards on 18 carries and scored two touchdowns. Price scored both touchdowns in the third quarter on runs of 12 and 8 yards to secure the win and a perfect 16-0 season for the Comanches and a 13-3 finish for the Panthers. But in a sense, Shiner’s defense decided Mart’s fate on the opening possession. The Panthers gained 6 yards on two runs by Wayne Atkinson and then lost 8 yards as quarterback Lee Miles was sacked by linebacker Darby Dariiek. It was the first of five sacks by the Shiner defense, which also picked off three of Miles passes. Jeff McAfee made two of the interceptions and Brian Kurtz grabbed the other one. The Comanche defense limited the Panthers to 125 yards of total offense. Mart gained only 31 yards on the ground and 94 through the air. But 61 of those passing yards came in the waning moments of the game when the outcome was already decided. Mart crossed midfield only three times in the game and its only penetration came on a long pass in the last minute and a half of the game. That 61-yard pass was a lateral by Miles to wide receiver Paxton Joiner, who tossed a pass to wide open tight end Michael Baker. Baker was run down by the Comanches at the Shiner 16. Later a penalty moved the ball to the 8. Two plays later, McAfee made his second interception, in the end zone with five seconds left to preserve the shutout. The shutout was the fourth in six playoff games and the eighth of the season. The field was a madhouse only a few minutes later as fans swarmed the Comanches, passing out hugs, kisses and congratulations. Calvin Tucker, who has been head coach at Shiner for a total of 18 years, was hidden by the pack of people for nearly 20 minutes until his wife and son Kevin, a cornerback, broke through to deliver a kiss and hug, respectively. It seemed nearly everyone on the field paused to shake Price's hand. but the quarterback's praise was for the defense. When asked what factor turned the game to Shiner, Tucker cited Price. Price gained 154 of his 156 rushingyards in the second half. Shiner got the ball to open the second half and moved 80 yards in five plays to score. Price contributed 77 of the yards on three plays. On the Comanches first play from scrimmage, he dashed 42 yards on a keeper around left end. Only a tackle by Miles at the Mart 42 saved the touchdown. Two plays later, Price went around the right end on a keeper and again Miles had to make the saving tackle after a 23-yard gain to the Mart 17. Two plays later, Price kept the bhall again and went around left end to put Shiner ahead 12-0 with 10:09 left in the third quarter. 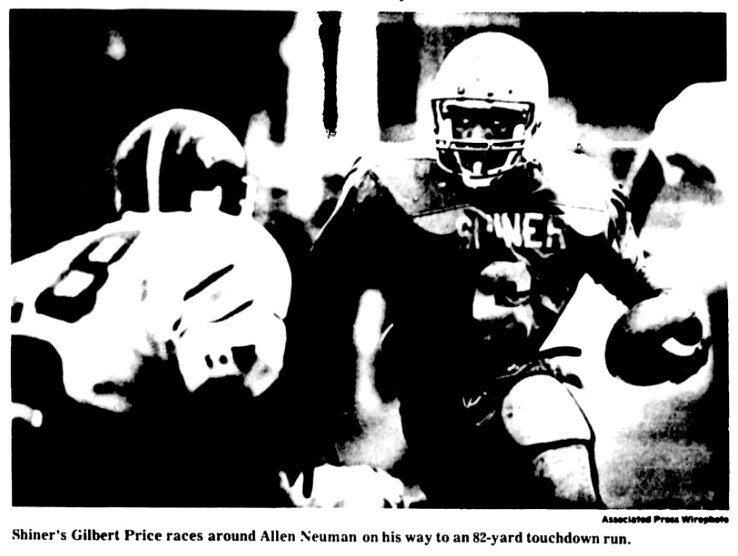 Price tried to run in the conversion, but was stopped by Allen Neuman. A holding penalty stopped Shiner's next possession but Price scored on the third possession. going 82 yards on the first play on a keeper around left end with 4:41 left in the third quarter. Again, Price tried to run in the conversion, but was smothered by the Panthers at the 5 and the Shiner lead remained 18 points. Mart didn't cross midfield for the first time in the second half until just before the third quarter ended. The Panthers were aided by a 15-yard personal foul against Shiner and an 11-yard run by Terrell Pride to the Shiner 46. Two plays later Miles hit Neuman for a 42-yard touchdown but the score was nullified because Neuman never reported to the huddle. Instead, the receiver stood on the sideline by the Panther bench, then ran downfield to catch the pass and score. Kevin Tucker then made back-to-back sacks for a loss of 20 yards to push the Panthers back to their own 24. Mart didn't threaten again until the 61-yard tnck play just before the game ended. The Comanche defense shined in the first half to help Shiner win the battle for field position and set up the only touchdown of the first half. The Comanches had to travel only 36 yards for the score on their second possession. It took six plays. Price threw a 12 yard pass to Michael Panus and also ran 13 yards to the Mart 1. Shawn Carroll scored on the next play following the surge of the Comanche line into the end zone. Darin Wegener s kick was wide left but Shiner led 6-0 with 3:40 left in the first half. Mart didn’t make a first down until the second quarter and didnt cross midfield until Atkinson busted loose on a 26-yard run. Shiner stopped the Panthers at the Comanche 24. Atkinson's 41-yard field goal attempt with 1:59 Jeft in the half was short. Kurtz and McAfee picked off two of Miles passes in the first half as the Comanche defense limited Mart to just 51 yards of total offense. Norman Dolezal and Panus also recorded sacks of Miles. Atkinson finished the game with 44 yards on 11 carries und was the leading rusher for Mart. Lennis Brooks gained 58 yards on 13 carries for Shiner and Carroll rushed for 51 yards on 16 carries. Shiner fumbled seven times in the game but each time recovered the ball and didn't commit a turnover in the game.